One of the most frequently-asked questions is “What is that symbol on the side of Central High’s wall over the auditorium entrance?” Nobody has come up with an answer. 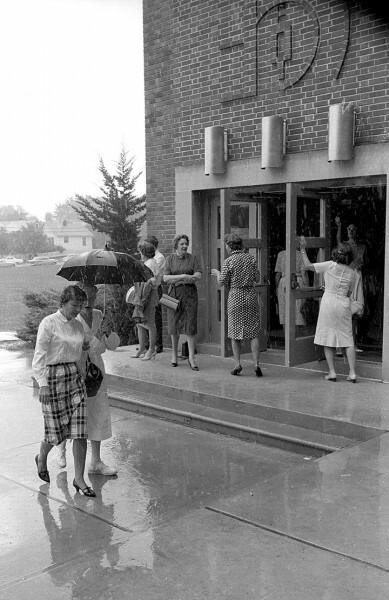 Here’s a look at it on a rainy day, probably in 1965. I think Mrs. Muegge is the woman in the dark dress on the left. The two women in the doorway on the right may have worked in the library. You can click on the photos to make them larger. 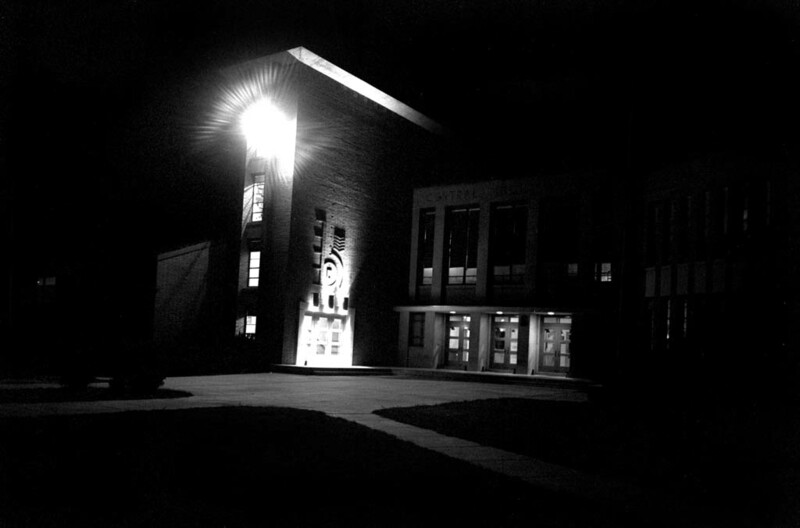 Here’s a view of it at night that appeared in the back of the 1965 Girardot. I shot it using the school’s Crown Graphic 4×5 camera. I went back to recreate the photo in 2009. Here’s how the photos were taken then and now. No clue about the symbols, but in searching for the architect’s name, I stumbled across a current dress code for CHS which left me laughing aloud. Never went up in the tower part, what was it used for? That’s a good question. I’m going to have to check it out when I go back to Cape at the end of the month. I never saw a door leading to it. The tower stored magazines and other library “stuff”! Eileen Gerhardt designed the winning drawing for the entrance column for the Caruthers Street school. Cobb School burned and African-American students began attending Central High School. September 8: the school year opened in the new $2,000,000 building on the site of the Battle of Cape Girardeau. A football game honored Harold Kuehle who had been injured in the Caruthersville game. Savings Stamps were sold. Keep digging. You’re ahead of me. Found a Girardot page on http://www.e-yearbook.com with her picture. But I’m not a member and cannot make out what it says. It looks sort of like the end of a music staff on the left (five lines and four spaces – Every Good Boy Does Fine). The inner curve is reminiscent of a bass clef. From some angles, it looks like a tuning fork inside the curved lines. Interesting. I’d say the music symbols would definitely fit with the fact that it’s on an auditorium. I thought there was just storage space in the tower. The ladies’ teachers’ lounge was just to the right of the main entrance, when I taught there. It was tiny. I think there may have been four or five chairs, tops. On another note, seeing Alta Muegge, standing there at the door, makes me wish I could go back and talk with her again. She was such a comfort to me my first year at Central, when everything was so overwhelming. I went up there one time,they had books and other things stored there. The entrance was in the Library, left side in the back, as I remember. Jesse James almost let it slip out…the tower was used for secret light bending experiments and bricks sticking out on the side of the building were a pattern made when the experiment went terribly bad. Nothing more…move along, nothing to see here. Jane Neumeyer — where did you find the current Central dress code? Back in our day, girls could only wear slacks (no jeans) If the temperature was below “0” Our skirts couldn’t be shorter than the middle of our knee. The skirt length test was you had to kneel down and your skirt must touch the floor. Otherwise you were sent home to change. Central dress code? Oh Yes! Not that anyone would remember but I think it was the Winter of 1961-1962, the boilers went out. No heat in the school for a couple of days while repairs were being made, but they still wouldn’t let the girls wear slacks. A few of us (no names to protect the guilty) decided to protest so we brought skirts to school. During lunch break at the Tiger Den and lower hallway, we rolled up our pants legs, put on the skirts and paraded around until we thought the word might get up to the office then we ducked in the boys locker room and changed. We just thought a little common sense under the circumstances could be used by the administration. Alas, I don’t think our protest worked! I think that symbol looks like the Mayan symbol for the year 2002. Hey wait, did they predict when the high school would be adandoned as a high school? I remember having an English class in the tower in the late 1970’s. This was the time of major renovations and the addition of the new gym/pool. This is a bit off the subject, but if my memory has it right I had Mrs. DeJournett in English Lit class in “68”. I just wanted to say thanks. I think it looks like the shape of the National Honor Society pin that is given to the recipients. It represents a “Keyhole” or the shape of the end of the key and the bricks that are in a circular form are the different eras in one’s life that the key opens. And it’s placed over the school door as the doorway to education. I never really noticed it when I went to Central from 57-61, but appreciate it now. I currently work in this building and I have always wondered about that symbol, too. I do know about the tower as I have to carry boxes of files to the top floor periodically. You can access the tower by way of a staircase just outside the auditorium. It is five flights of stairs to the top. You can also get there by going up in the elevator to the second floor of the building, then passing through two classrooms, but you still have to climb three flights of stairs. The top room in the tower is used for storage. Other rooms in the tower are used for an office and a small classroom. 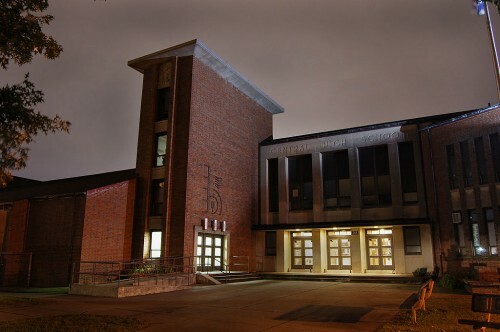 Yes, Gail…you rang a bell in my memory – I had an English class in that tower around 1980 as well.